Great thank you and tribute! Here’s to hoping the parks re-open soon. Hi Cassie… I couldn’t agree more with you! I’ve had some wonderful experiences with Park Rangers over the years. They are amazing, so patient and willing to make our experiences even better. You state it beautifully! This is very inspiring to me. And I too hope the parks re-open very soon! Take care. Wow, beautifully written. I definitely want to engage the park rangers now when we go camping and hiking. You being so thankful for them, makes me so thankful for them. I look forward to having some of the same experiences in the future perhaps with our own children. I sure hope they can shut down the shutdown as well, get everyone back to work and being paid! Thank you Andrea, Laura, Dave, and Kathryn for your kind words! A wonderfully written thank you! As a retired National Park Service Ranger, I appreciate your comments so much. It has been so sad during this shutdown to see so many NPS employees harassed and cursed for the parks being closed; as if such an employee had anything to do with the decision. I am convinced the American people love their National Parks but unfortunately right now their attention is coming too often in the negative form. 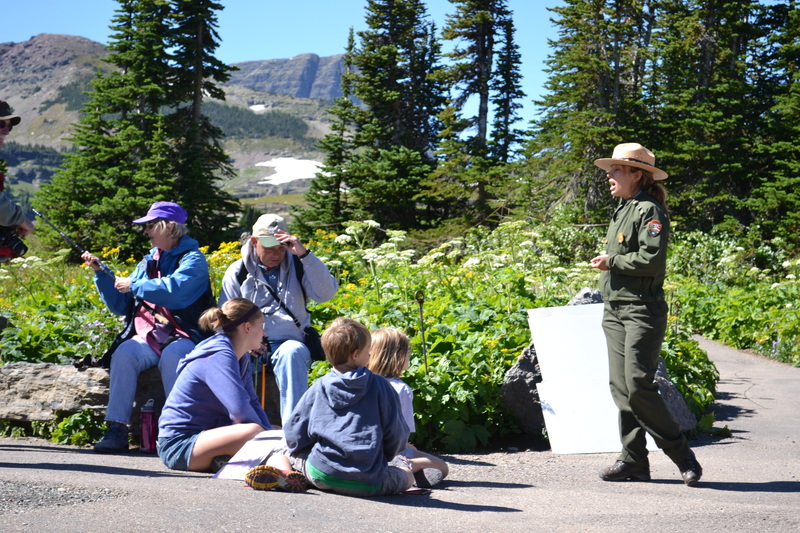 NPS employees are always grateful when they hear how much someone loved their park experience. ..”as if such an employee had anything to do with the decision.” Thank you Fred for your service with the parks. I’m so glad you found this post and I hope you know that there are many people out there that feel the same as me! As a interpretive ranger, thank you so much for this. It brings tears to my eyes. My NPS family is going through a confusing and frustrating time. We do our jobs for the nature and the people. Especially for such a lovely family like yours. Thank you for being a ranger Kat! We know so many of you are struggling and can only hope that this gets figured out soon. . 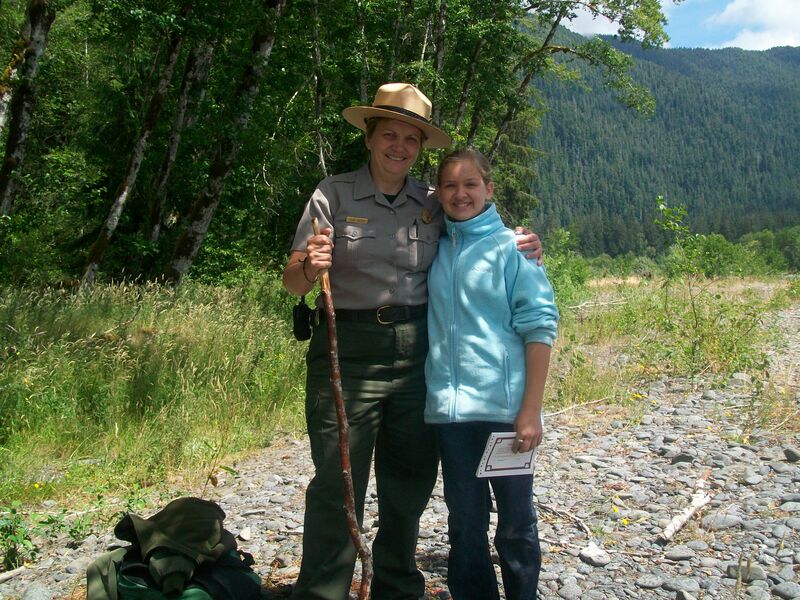 There are so many families out there that love our park rangers! Thank you Cassie! We love doing the junior ranger books, even if like you said, sometimes at first we think, oh no, not more junior rangers… the kids always turn our attitude right around and remind us why we love this job! I hope we can get back to work soon, I feel so bad about all the families who are being locked out of our visitor centers. Thank you for your service with the parks Hope, and a special thanks for all the Junior Ranger work. 😉 I also think about all the families who have planned and are missing out of special moments in the parks as well. Thank you so much. I have worked for NPS for 22 years. The visitors to the parks especially the kids bring joy to my life every day. Thank you so much for your long service Jim! The parks are a special place for kids, and allow them to learn and grow in ways that no other place can. So many of us hope the NPS is up and running soon. Thank you so much for your words! We’re all in a tough spot right now, but it does my heart good to know that our jobs are meaningful. And let your kids know – I’m a ranger now, but twenty or thirty years ago, I was the same kid that pushed to the front of the tour group and asked and asked and asked, and loved the rangers for answering all my questions. Thank you for growing up to become a ranger Kate. I told my kids your story and they loved it! You and all the other rangers have positive impacts on families every single day. What can be more meaningful than that? This is really great! Thanks so much for writing it. I’d also like to express my thanks to the road crews who keep them open for travel, the maintenance crews who keep the bathrooms clean and the garbage cans empty, the resource crews who manage our rivers, trails and pull all those nasty exotic weeds, the rangers who save our lives, and the park administration who makes sure they all get paid. There is so much more than meets the eye to running a National Park…we are a team and we rock! Keep up the good work – everyone! Thank you Rick for your service and for reminding us of all the other people that work to keep the parks up and running. I hope they are back open soon… Hang in there! Wow! Made me cry. Thank you so much for appreciating all that we do! You are so appreciated Helen. Don’t forget it. Thank you for your service. Thanks for your Kind Story Cassie, it means so much to know that my fellow ranger coworkers are doing great work out there for you and many other visitors. Thank you for all that you do Sierra. The parks hold such a special place in our hearts, as do the rangers we meet along the way. Thank you for making me teary eyed with all the kind words and inspiring pictures. Makes me proud of what I do and makes all the other mean comments about the NPS this week fade away. It’s people like you that inspire us to keep doing what we love and what we know is important. It breaks my heart that people are being critical of the NPS employees. You should be proud of what you do as you inspire so many of us every day. Thank you for your service with the NPS. Thank you Laura! I’m so happy that it has reached them too. Thank you for sharing and showing a sincere appreciaton for our park rangers. As a VIP (volunteer in the park), I work alongside some awesome folks and look foeward to doing so again very soon! Please, folks, support your parks and the rangers sho make your visits extraordinary! Thanks, again, Cassie for your support of the parks and the rangers. Theresa, volunteers are a vital resource in any organization, but I’m sure most especially in our parks. Thank you for your service. 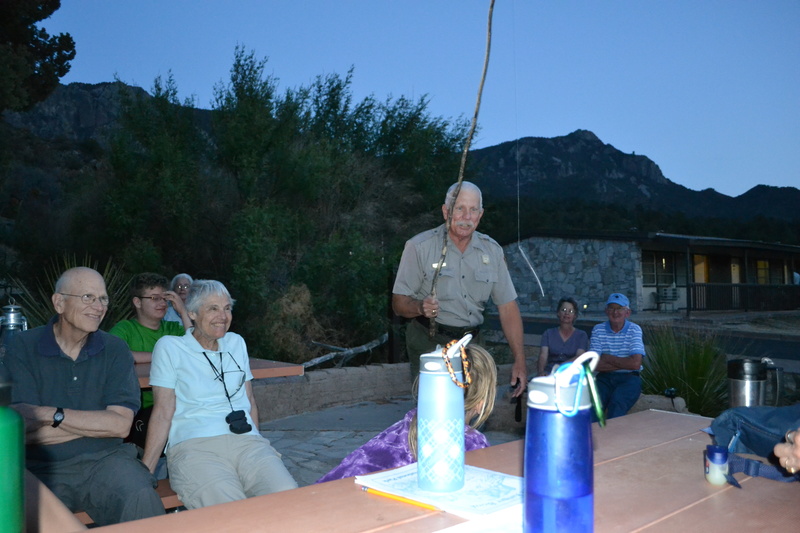 The Rangers and all other park staff do make our visits special and memorable. When John Latschar was Superintendent at Gettysburg, either he or, on the rare occasions he had a conflict, his representative would attend the annual volunteers dinner for volunteers at GNMP and Eisenhower National Historic Site. He would always tell us how the volunteer hours of service translated into the equivalent in positions that the Gettysburg parks needed but didn’t have. It meant a lot to us volunteers to know that we made a difference and that the NPS knew it and appreciated it so much. It kept volunteer morale very high. Thank you for serving in the role of VIP…folks like yourselves truly are VIPs! I am the Volunteer and Partnerships Coordinator at Mammoth Cave, and I appreciate all that you and the other volunteers do in the parks. You all are truly “force multipliers”, and there’s so much that we can’t do unless we have volunteer help. You Rock! Well done! Cassie-That is wonderful and I am forwarding this to friends who are both current and former NPS employees. I know it will mean a lot to them. Thank you for putting into words what so many of us feel. We’re just not “news” the way the grandstanders are. Thank you for sharing this post M.D. I’m so grateful that it has found its way to so many Park Rangers and other NPS employees. They deserve to hear our gratitude. As a park ranger, THANK YOU. It is because of people like you and your family that we go to work every day. All we want is for the rest of the world to experience what we have had the honor to protect and preserve. When folks like you come to our walks/talks, approach us at the visitor center, or flag us down on the trail, we get the pleasure of being able to provide you with a glimpse of the beauty and history that surrounds us. Thank you for being a part of our experience. Thank you for being a park ranger Mel! Visiting the parks is such an inspiring and memorable experience for my family and for so many others. Thank you for always being there to help us, to teach us, and to protect us. Thank You, Cassie. Comments like yours are better than any paycheck !! Meeting people like you and your family is what we are missing the most right now. Thank you for your service Walter. 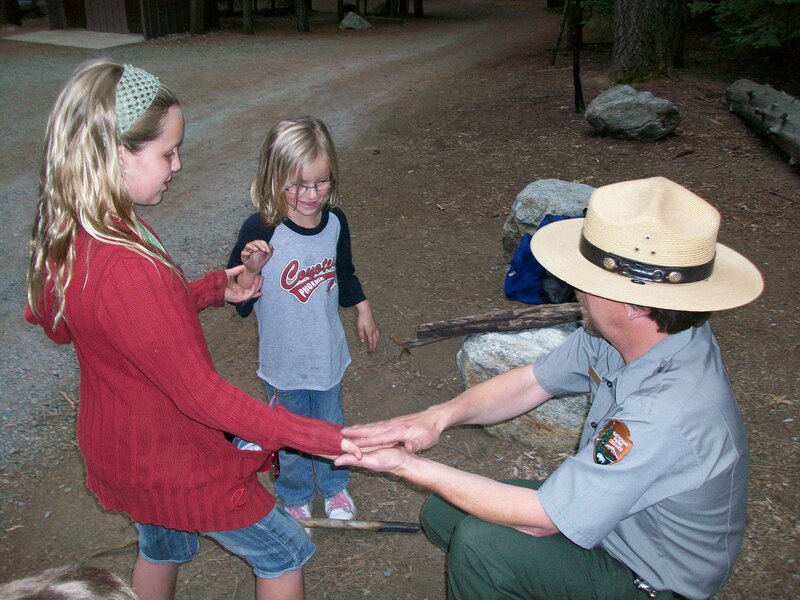 The park rangers always make our summer trips special. Death Valley is such an inspiring park! I was even moved to write a little something about that park in particular and posted it under Travel Writing. You might like it. Wow! Cassie, I find myself sitting in a coffee shop with tears in my eyes after reading this. I’m a seasonal National Park Ranger (many of those you encounter in the visitor centers and at programs are only hired for the season). I had decided I wanted to be a park ranger when I was a kid after a 2-week-long Junior Ranger program. I wanted to help people love these places, as I have come to love them. 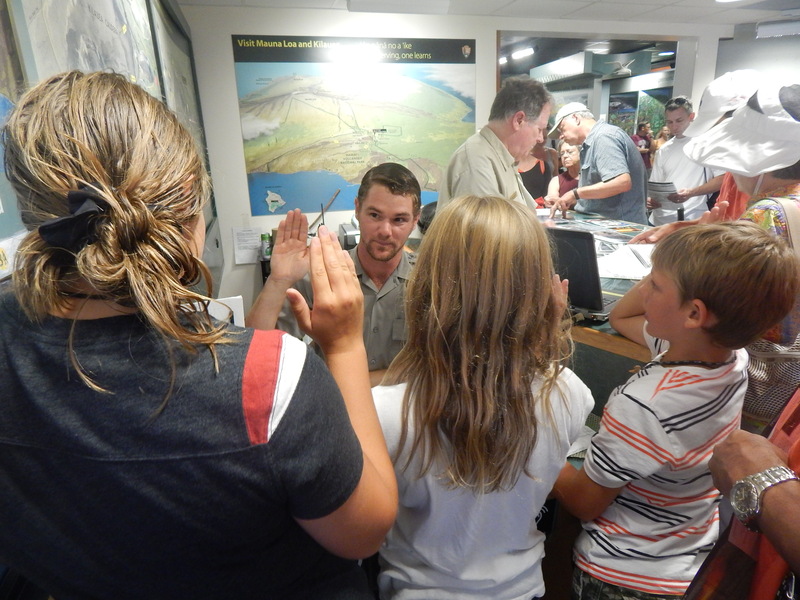 So, Junior Rangers–like yours–are very important to me personally. It took me over 20 years to work my way into the National Park Service as an interpretive park ranger, which is my primary job. I’ve been a Park Ranger for the better part of three years now, and have served in a number of roles in that time: interpretive park ranger, visitor use assistant, search and rescue team member, park ambulance driver, medical first responder, education technician, bear team member, event chief of operations… And, my deepest joy still comes from administering the oath to new Junior Rangers. After all the negative feedback I’ve gotten from the public and even some family members, who just don’t understand what is happening, I found myself wondering if I even made a difference as a park ranger. And, at that moment, I read your blog. It was a great reminder of why I worked so hard to be a park ranger. Thank you for sharing this with us. I’m sure you and your family have impacted many more rangers than you realize by coming to our programs and visiting (and engaging with) your parks. Thank you for your dedication and commitment, Jennifer. In addition, to the rangers and other NPS employees mentioned here, I would also like to thank those who have supplemented the appallingly small NPS budget through providing services and money to the various parks, etc. within the National Park system. This includes the volunteers and Friends groups, other partners including the public-private partnerships such as the Gettysburg Foundation, and the Licensed Battlefield Guides (LBGs) at Gettysburg NMP. The LBG’s are also losing income due to the shutdown because many tours have had to be cancelled unless they can be conducted from public roads or outside the park (the battlefield is larger than the park). Part of many rangers’ duties include working with these various individuals and groups as part of the mission set forth for for the NPS in Section 1 of its Organic Act “The service thus established shall promote and regulate the use of the Federal areas known as national parks, monuments, and reservations hereinafter specified by such means and measures as conform to the fundamental purpose of the said parks, monuments, and reservations, which purpose is to conserve the scenery and the natural and historic objects and the wild life therein and to provide for the enjoyment of the same in such manner and by such means as will leave them unimpaired for the enjoyment of future generations.” 16 U.S.C Section 1. Jennifer, I’m so glad that this post reached you when it did and that it can offer you a small kind of comfort. I hope you all realize how appreciated you are and that you make a lasting difference in the lives of visitors every day. Thank you for your service. And Thank You M.D. for the reminder to all of us of how many people it takes to keep our parks up an running. Thank you, MD and Cassie. Cassie, I’ve shared this link with Park Ranger associations I belong to. I think we all need to hear this right now. I’m very honored to have had the privilege to serve people like yourself. Thank you for giving me that opportunity. Cassie, you don’t know what a shot in the arm you’ve given us! Lately, we’ve been used as punching bags by both our elected officials and the public, and it is so rewarding to read about what the parks have meant to you and your family. And, to Theresa the Volunteer In Parks, thank you for your service! I am the Volunteer and Partnerships Program Coordinator at my park, and I so much appreciate all you and your brother/sister volunteers do for the public and the resources. I spent 20 years as a law enforcement ranger, having worked several shutdowns, and I know that the folks on the firing line are handling their jobs with aplomb and professionalism! And, Cassie, it’s visitors such as you and your family who make our jobs so rewarding! Thank you for the opportunity to serve you and the rest of the American public! Eddie, our explorations of the parks over the last five years has enriched my family and our life in so many positive ways that it is hard to explain. I know that there are many more American families that feel the same. I’m so overwhelmed and grateful by the responses to the this post because it means I was able to connect with the people that have (probably unknowingly) given so much to us. Thank you for all that you have done for our parks. Thank you, Cassie, for telling it like it is for all of us that love the Parks. As an interpretive ranger in Rocky Mountain National Park, I look forward to seeing the visitors like you and your family. Thank you for becoming a Park Ranger Marilyn and for your commitment to our parks.. I’ve been looking forward to the time when we can come explore Rocky Mountain N.P. for a long time. I hope that we will be there soon. Thank you Cassie, I am a maintenance supervisor at the busiest Park in the Park Service and I have to say there are times the crowds are more than we can handle. But, not being there and taking care of that Park and talking with the many visitors, is far more frustrating than any crowd. Yes, sometimes our Parks are being LOVED to death but, I’d much rather be there surrounded by that love than to be also, locked out wondering what will need to be done when we get a chance to reopen. All I and the rest of the National Park Service employees want, is to do our job as stated in the Organic Act. “To preserve and protect for the enjoyment of future generations…” Again THANK YOU for your acknowledgements. Thank you for your service Dale. I can only imagine how much you have to do every single day to reduce the impact of thousands of people in the parks. There is no doubt in my mind that without people like you to protect them, our parks would succumb to the trample of feet. Thank your for doing your part that allows all Americans to share and enjoy them. Really appreciate this. We are current NPS park rangers and not feeling all that loved these days. Thanks you for the kind, positive words! I hope you know and remember how grateful so many Americans are for our parks. Thank you for your service Alana. I can’t thank you enough for your gratitude. As a furloughed Ranger it means a lot to know that people are thinking of us and it’s comments like this that remind us why we do what we do. Hopefully we can all get back to serving you, your family and the American People soon. Thank you for your service Eddy. It is so very much appreciated. I hope you are back at work soon too. Thank you for being a part of our great trip Travis, and thanks for everything you do for park visitors every single day. We hope you are back soon too! Thank you for your long service Jeff, and for sharing your experiences with your students. Perhaps it will inspire them to be life-long visitors of our parks! Thank you so much Cecelia. Thank you for such a beautiful note. I have been a ranger for over 23 years. I treasure the times I get to hear children laugh and giggle as they discover our parks. I am one of the rangers who is working without pay while watching my friends and literally go stir-crazy by being furloughed. They all want to work and come back. One of my friends is trying to figure out how much trouble they might get into if they do their parks in classrooms visits at the local school anyway (the answer is – potentially a lot). I am forwarding this to all my NPS co-workers and volunteers. Suzie, I can’t express how much it means to me when I hear my children laughing and playing in the park wildernesses. It keeps us coming back over and over and over again. Thank you for being a long-time ranger and for giving so much of your time to the parks. I sincerely hope all of you can be back at work again soon. About an hour ago, I received a text from my supervisor to put on the gray and green and my flat hat, and saddle up. As I was getting ready, I thought about you and your family, and how you have supported us through these last couple of weeks. Speaking for myself, and I’m sure others who have weighed in here would agree, I would think about all you have said and what it meant to me…to help keep me motivated. So, at least for the time being, we’re back in business! And, if your travels bring you to Mammoth Cave National Park, just ask for Eddie at the Information Desk…I’d love to meet you and your family. Again, thanks for the opportunity to serve you! Eddie, that is such great news! I’m overwhelmed by your words.. Thank you. We will most definitely try to find you when we reach Mammoth Cave. Have a great day! Eddie-Welcome back to work to you and the rest of the furloughed NPS and other federal employees! I am sorry that you were used as pawns by the majority in the House of Representatives. Thank you and I’m glad we’ve had the opportunity to let all of you know that you are appreciated and respected by so many. M.D. – Thank you so much! I’ve been here in my office for almost an hour-and-a half, catching up on emails (believe me, they still came while we were out! ), and getting myself reacquainted with my office, hoping I had not forgotten all my passwords! LOL! But, what’s really cool, is to see the enthusiasm on my colleague’s faces and how they are so motivated to get back into the game. As I said before, it’s your support that keeps us going, and we live to serve you and protect the awesome resources under our responsibility. And, I can’t help but believe that you and Cassie are the tip of the iceberg of NPS supporters. Even though we’ve gotten our eyes blackened over the past couple of weeks, I am of the opinion that we won’t have to look very far to find more fans today! If we can do anything to serve, please let us know! Next Next post: Local Lands Need Our Help Too!